The exotic named case of Rousselon Freres et Cie v Horwood Homewares Ltd  EWHC 881 (Ch), which you can read here on BAILII, was a decision of Mr Justice Warren in the Chancery Division of the High Court for England and Wales. Rousselon applied to invalidate two UK trade marks belonging to Horwood, claiming that there was a likelihood of confusion between Horwood's later marks (right) and three of its own earlier UK trade marks (two of which are shown below, the third being the word mark SABATIER). The bones of contention were mainly goods in Class 8, which included knives, and the word 'Sabatier' -- apparently a surname. The application also covered domestic utensils in Class 21. 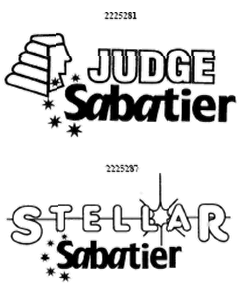 "The words JUDGE and STELLAR do not "hang together" with SABATIER to make a meaningful whole, and even less so when presented in the logo form in which they have been registered. To my mind the positioning and difference in the style of font used and the "star" curve around the "S" suggests that SABATIER is a separate element. As far as I am aware, the words JUDGE and STELLAR are not descriptive of the goods, and by their relative positioning and size are the dominant, distinctive element. The corresponding graphical representations (judge's head and star) serve to emphasize the words but also contribute to the overall visual impact. However, these elements do not overwhelm SABATIER. The question is as put by Geoffrey Hobbs QC in his decision sitting as the Appointed Person in Raleigh International Trade Mark,  RPC 202 is whether the later mark "captures the distinctiveness of the opponents' mark". Rousselon appealed, arguing (among other things) that the hearing officer had erred in principle in holding that there was no likelihood of confusion, having essentially accepted that the word 'Sabatier' retained an independent distinctive role in Horwood's trade marks. * "the actual test ... remains whether, because of similarity of marks, there is a likelihood of confusion. ... It does not say that a composite mark which contains an earlier mark will always carry a likelihood of confusion; rather, it says that there is such likelihood if the earlier mark has an independent distinctive role. However, the assessment whether the earlier mark does have such a role is ... something which has to be decided before answering the question whether there is a likelihood of confusion. To elide the question of an independent distinctive role with the question of the likelihood of confusion runs the risk of answering the former question by first providing an answer to the latter. That would be to answer the question "Is there a likelihood of confusion" with the answer "Yes, if there is a likelihood of confusion" when the answer should be "Yes, if the earlier mark retains an independent distinctive role". * this being so, the hearing officer had erred in principle. His error was a significant one which vitiated the basis on which he had formed the view which he had. The court would substitute its own decision to the effect that the applications made under s 47(2) of the Act succeeded so far as the registration in respect of class 8 was concerned. The IPKat, who remained confused by the marks right through the judgment and hopes he's got them the right way round in this note, laments the over-intellectualisation of the test of likelihood of confusion of composite marks in the wake of the ECJ's decision in Case C-120/04 Medion v Thomson Multimedia (noted by the IPKat here). This judgment ran to over 100 paragraphs and requires a good deal of effort to follow. No wonder hearing officers run into trouble. Merpel says, but how will consumers know whether they are likely to be confused or not if they don't have a lawyer to tell them? My GP, or is that MyGP? Community patent: machines to the rescue! French patent attorneys: an endangered species? Who says there ain't no F in justice? Hyperlinks as Original Multimedia: can you help? Do stripes need to be kept free for use? Beecham reference: can you help? Should UK opt for Rome?